This fishy toy has become a family favorite ... I've made sure that every dog relative has one (and in one case two - Ace loved his first Gefilte to pieces, literally!) ... hilarious and great fun for everybody concerned! This popular Hanukkah toy features a voice box that says 'Oye Vey'. This is a holiday toy that will make your pups holiday more like a HOWLiday. Scout is a 2 year old standard poodle who has had a Gefilte Fish toy since he was a puppy. I was amazed that he played with it for so long, even after it no longer said "Oy Vey," and he had chewed most of its fins off. He'd get it dirty and we'd throw it in the washing machine and he'd sit shiva at the laundry room door until it was returned to him. Sadly, about a week ago "Gefilte Fish One" finally started leaking its stuffing. We sewed it up temporarily while I ordered a replacement, which arrived today. Scout watched me open the package and was so excited when he saw what was inside he started jumping and could hardly wait for me to take it out of the plastic bag, remove the label and give it to him. Since then, he's run around the house with the fish in his mouth, determined not to share it with his brother. To say that he loves that toy is really an understatement. It's his absolute favorite possession EVER! Jake loves his fish, oye vey! 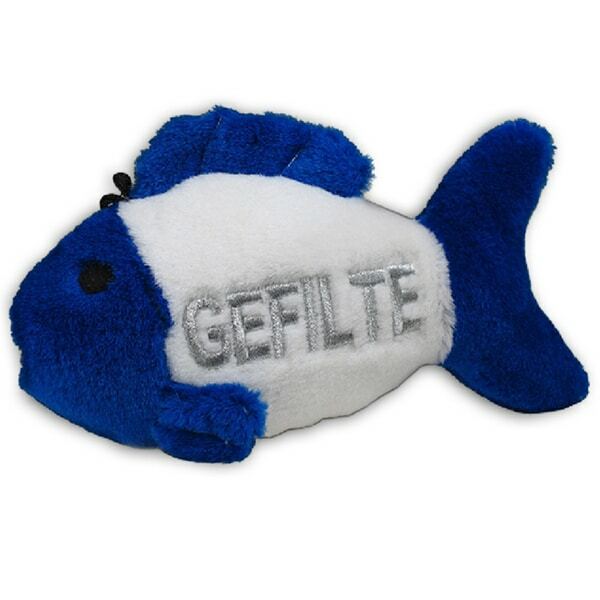 This is our second Gefilte Fish Toy. The other lasted for YEARS! Our dog was quite excited to see it again with a functioning sound! We have had seven of these over the years. When we wear one out I find another. The dogs love the fishy sound. bought one at the pet store - Jake (my dog) and everyone else "loved it". It is durable and lasted weeks before Jake got the voice box chewed out. Perfect for the perfect Jewish dog. "Oye Vey". I own one and want to give one for a gift.